24th St., 28th St., 32nd St., 34th St., 38th St., 40th St., 43rd St., 45th St., 49th St., 51st St., 54th St., 59th St., 61st St., 65th St., 71st St., 75th St., 77th St., 81st St., 84th St., 87th St., 90th St.
Beach tags are required for all persons over 12 years of age. Wednesdays are FREE. Tags may be purchased at the Beach Badge Office on JFK Boulevard or from one of the beach badge inspectors on the beach. Beaches are protected by lifeguards 10:00 AM to 5:00 PM, Monday through Friday, and 10:00 AM to 5:30 PM, Saturday and Sunday. Beaches north of 20th Street have no designations. These beaches are not protected and use is at one's own risk. Activities such as surfing and volleyball are allowed on these beaches. Bathing is advised on protected beaches only. Flotation devices with a fin may not be used on a raft beach. Flotation devices with a fin, such as belly and body boards, may be used on the surfing beaches provided a leash is used and flippers are worn by the operator. 30th St., 56th St., 79th St.
24th St., 28th St., 34th St., 40th St., 45th St., 51st St., 59th St., 65th St., 75th St., 81st St., 87th St.
26th St., 37th St., 42nd St., 48th St., 53rd St., 63rd St., 74th St., 82nd St.
25th St., 30th St., 53rd St., 57th St., 67th St., 72nd St., 88th St. Between 20th St. and 22nd St. In order to operate a sailboat on a Sea Isle City Beach, an owner is required to obtain a license from the municipal clerk. Townsend Inlet Bridge area situated south on 93rd Street. 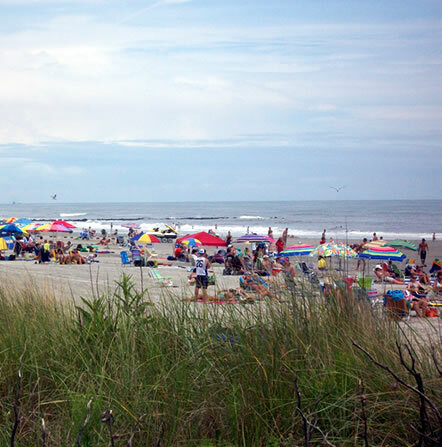 Sea Isle City beaches situated north of 20th Street. Any beach area adjacent to rock jetties not designated as a surfing or kayaking beach.